Schoolies volunteers: Members of Rosies are ready for a busy time as the annual Schoolies Week starts on the Gold Coast this weekend. ROSIES on the Gold Coast has no concerns about bad behaviour during Schoolies Week, which starts on the Gold Coast this weekend (November 17). “I truly believe that it’s overblown. It gets blown out of all proportion,” Rosies Gold Coast co-ordinator Kathleen Vlasic said. “There are 25,000 kids that come to the Gold Coast. “If you hear about 40 kids who have mucked up, well, that’s a very small portion. Ms Vlasic said the majority of school-leavers who descended on the Gold Coast during the two-week period were well-behaved, and well looked after. “There are a lot of good people out there volunteering to make sure everyone is okay,” she said. “Rosies is there from the beginning to the end. “We stand on the beach and we’ve got a tent there if anyone needs help, support, a bit of first-aid, or might need to have a rest or break. “We’re just there as a back-up for those who might need some support or help. As well as tending to precarious party pupils at this time of year, Rosies on the Gold Coast operates six food vans, a drop-in shelter and a coffee cart in the Southport courthouse. “A lot of people are going before the courts for lots of different reasons – not necessarily criminal,” Ms Vlasic said. “They don’t know what’s going on, or what’s going to happen, and they can get quite frightened. Catering for the increasing number of homeless people on the Gold Coast is no easy task. 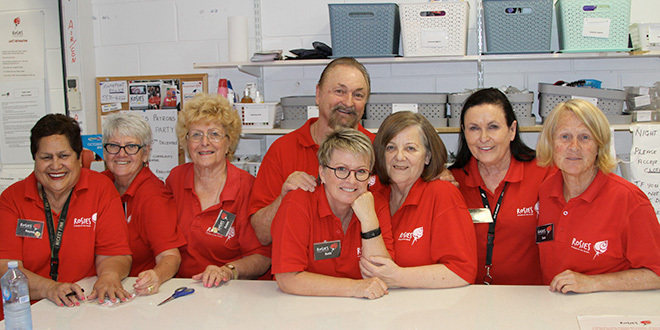 Ms Vlasic said Rosies often relied on the help of generous people in the community, like food rescue charity OzHarvest, with whom Rosies has forged a long relationship. “When I was the co-ordinator way back, OzHarvest approached the drop-in shelter and said they would like to set up an organisation that collects all the food that’s going to waste,” she said. Rosies provides cheap boxes of food, and free boxes for those who need it the most. “Some people will pay, some people won’t – it depends on what their situation is,” Ms Vlasic said. Ms Vlasic said it was the strong hand of friendship that made Rosies special. “It’s not about the food, or the coffee – although they need it and they like to have that – it’s really about just putting your hand out and offering an ear for them to talk to,” she said. “It’s like our friends on the street; they sometimes may not have a conversation with another person for a week or so. “So, somebody will sit down and listen to their story and where they’re at and what direction we can get some help for them. “It’s really, really about the hand of friendship.